Ouch. I was 36. And apparently not even a lamb dressed as mutton, but fast approaching mutton dressing as jerky — if we accept that the way women dress can be likened to the life stages of a sheep. Deflated, I left that pretty dress hanging on the wire fence surrounding those markets on West 76th. But I still wear vintage. 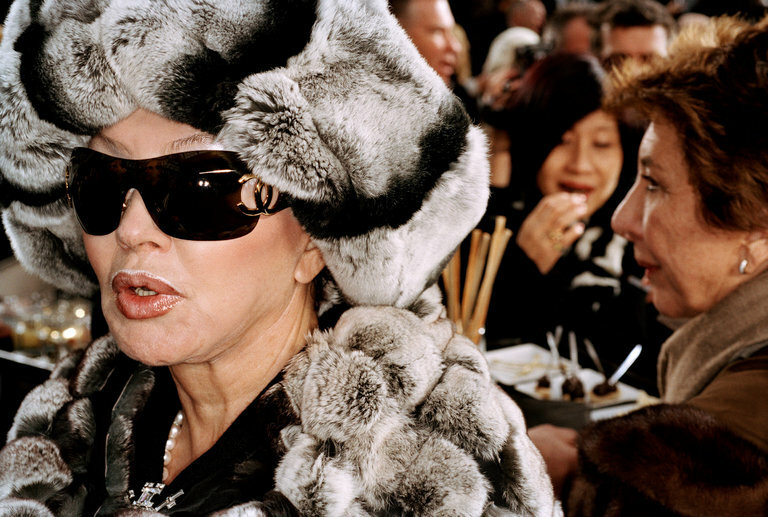 So what does it actually mean to dress like an “old lady”? Or even just “dress your age”? Women are more often criticized for dressing like younger, not older, versions of themselves. When you reach 40, you’re suddenly inundated with advice about “age-appropriate” wear. Women are not praised for dressing like fabulous young things now. As we ascend the ladder of wisdom and maturity, we are cautioned to adopt restraint, to be “classic,” “sophisticated,” to eschew skin in favor of prim. And with every passing year, to occupy less space and be more demure — and dull. We are also told to monitor our appearance in a way men are very rarely told to. Find me a man leafing through a magazine that tells him to upturn his collar to hide his neck wrinkles, and I will upturn it for him. After 40, we should, says a British fashion writer in The Telegraph, use plenty of conditioner on our hair and not risk a radical trim because “a bob at this stage could put a decade on you.” Yikes! The author goes on to say a maxi skirt can also add “10 years.” Which means: Get a haircut and the wrong dress, and bang — you’re 60. This is mutton shaming, ladies, and it has to stop. Must we give up on being “ravaged”? Or better still, ravished. All this nonsense is why I adore the funky grandmothers you can find on Instagram who dance about in baubles and proudly sport turbans. They refuse to fade, hide or match their attire to the wallpaper. But my greatest mutton-fantasy is just to wear and do what I want. To not have such preoccupations even cross my mind. Isn’t there a point when one can simply be a dowager, a grand old dame, or just a merry old boiler? When we can refuse to kowtow to prescriptions and permissions, but just march on in the shoes we fancy wearing? Queen Victoria ditched those suffocating corsets without blinking, much to the horror of her doctor. Instead, she wore exactly what she liked for half a century: mourning-black, with diamonds. Hillary Clinton is another such, staunchly campaigning on in her pantsuits. I have long savored the prospect of letting myself go. It’s just the most delicious concept: a balloon wafting into the ether, a raft flowing smoothly with the current. One day, I have imagined, I would find myself wandering along the street, hair askew, unkempt but cheerful, wearing a curious assortment of clothes — perhaps a vintage frock with dapper heels — that meet just my liking. I would saunter off, dangerously liberated, feeling envious eyes on my back — having reached, finally, the age when you can reject rejection. Posted in Columns, New York Times. Bookmark the permalink.